This rare expression of Napa Valley winemaking is one of only 60 bottles that will ever be made. Think of it as a bit of Napa Valley history in your cellar and celebrated in a glass with friends and family. Your Premiere Napa Valley wine is from grapes grown on a unique site between the Napa River and Yountville Hill in Hoopes’ oldest vineyard in Oakville. This site permits for natural flood irrigation, creating three different soil types. The vines were planted in 1983, and were all planted on St. George's rootstock and Bordeaux Wente Clone - but the three different soils contribute distinctive flavor profiles to these old vines. This unique wine was produced from rows that comprise less than 5% of their Oakville vineyard and feremented independently from wine from the rest of the vineyard. Anne Vawter loves horses and wine. Growing up on a farm in Walla Walla, Washington, Anne inherited a deep appreciation for agriculture from her father, as well as his love of wine. He introduced her to wine through tastings of Leonetti, L?? ?Ecole No. 41, and other wines from that region. After graduating from University of California, Davis with a B.S. 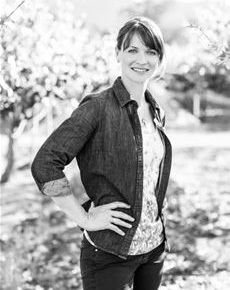 degree in Viticulture and Enology in 2002, she worked in wineries in Washington, California, and for an extended harvest season in Chile as the crew boss for Caliterra. Her arrival in Napa brought her to Paradigm Winery in Oakville, where she became Heidi Barrett?? ?s assistant for four years. Anne credits much of her own winemaking style to that period, but continues to challenge and test her palate. She frequently travels to both old and new winemaking regions in her quest for more knowledge. Anne began as Hoopes Vineyard?? ?s winemaker with the 2012 vintage. I love working with the fruit from Oakville.��� said Anne ���It���s my viticultural solar plexus. I have made wine up and down the Napa Valley, but no other appellation is as exciting to me as Oakville. My overall philosophy is ���work with great fruit���!��� She looks forward to continuing to work for Spencer Hoopes and his daughter, Lindsay Hoopes, the proprietors of Hoopes Family Vineyards, because of their commitment to the historical significance of their vineyards.